His slab is pretty elaborate for a black man of his time. I went on a field trip with a colleague recently to South-View Cemetery in Atlanta. South-View is a place that buries people regardless of race, even as Atlanta’s more famous cemetery, Oakland, started to get selective back in the 1880’s about who was allowed to be buried there. So, South-View was started by five former slaves in the basement of the same church where Spelman College was also founded. It boasts being the oldest incorporated business in the country owned by African Americans. It was no surprise to me that people were buried in death according to who they were in life. It’s the same story across The Milford College series. The separations will be reemphasized with a burial in the upcoming, The Mayor’s Mission. Mrs. Milford and family were buried on one side, and her former enslaved population on the other side. Given the closeness of the burial grounds to the house, it seems certain that the population of Milford will always take care of the land—future stories in the series will tell the tale as to what becomes of the land. Still, at South-View there is a different separation of graves. The concept of perpetuity care developed later on, so one side consists of the graves cared for in perpetuity and those that are not. This is the case in most graveyards and fortunately, South-View has a foundation in place to continue fund raising for the non-perpetuity side. Still the non-perpetuity side is where most of the oldest and most interesting funerary art resides. The separation was a reminder to me that people can be forgotten. 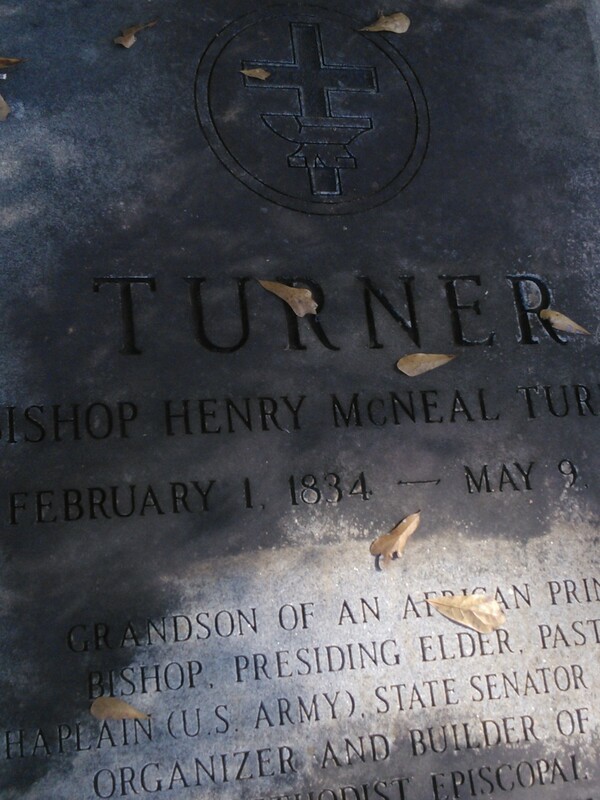 For example, I was surprised to encounter someone I’ve been researching on that no-perpetuity side– the grave site of one of my characters in The Mayor’s Mission, Henry McNeal Turner. I went by myself to see the sight of where one of the greatest African American citizens was laid to rest on a hill. The great man rests where the entrance used to be when there were horses. His elaborate slab is placed right next to that gate, and almost seems to be as a welcoming committee for folks who, when the bell rung, were welcomed to their eternal rest in South-View. Now? There is a different entrance and the corner where Turner rests sees far less activity and is quiet. I hope he doesn’t mind that I’ve put him in my stories, so that he’s not completely forgotten. Maybe my stories may even bestir some to contribute to the non-perpetuity care fund. I would hope his grave site, placed under a tree, will still be made suitable for others to come and bear witness to how he risked himself to further the education and lives of African Americans in Reconstruction. Cemetaries are interesting places-so full of history. We have a small one in our subdivision, set back in the woods. The slaves have a small stone with just their initials carved into it. That’s awesome Connie. I’m glad it is still there. Thank you for stopping by! Thanks Piper. I feel this is a topic I don’t know a lot about. It gave me chills when I read about African Americans being buried in swampland. How terribly sad. And that folks had to negotiate burials. God bless South View. I know Belle. And I agree. We owe a debt to those five men who fought for dignity for everyone. Thanks for stopping by!